Impress your dining partner with these restaurant-quality meals you can make in less than 30 minutes. Cooking for two can be tricky. Crowd-pleasers like soups, stews, casseroles, and big cuts of meat don’t really make sense, but a pieced-together plate of whatever’s in the fridge isn’t ideal either. It’s a dilemma that too often ends with a call to the pizzeria. There’s a better solution. 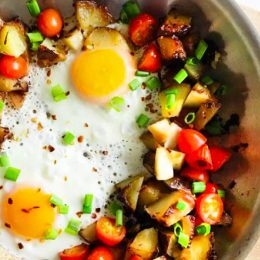 The six nutritionist-approved recipes below make the perfect amount for you and your dining partner. But that’s not the best thing about them: All offer restaurant-quality flavor and presentation for far less cash, calories, and time commitment. Pick your favorite, and you’ll have a delicious meal for two on the table in less than 30 minutes. This tasty recipe is easy to scale up or down, says Lara Ligos, R.D. The version below yields two servings and fits perfectly on a sheet pan without the ingredients getting crowded. What to do: Preheat oven to 400°F, and line a sheet pan with parchment paper. In a large bowl, mix all ingredients except tortillas and optional toppings until evenly coated. 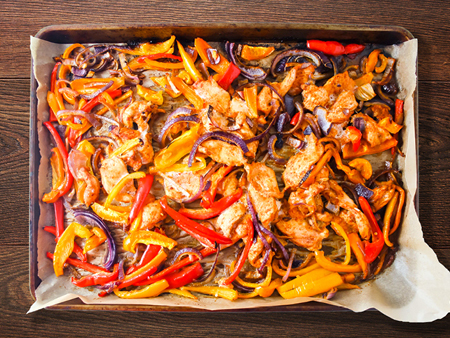 Spread fajita mixture evenly over sheet pan. Bake for 25 to 30 minutes, or until chicken is cooked through. Heat tortillas, and serve with the fajita mixture plus any optional toppings you like. 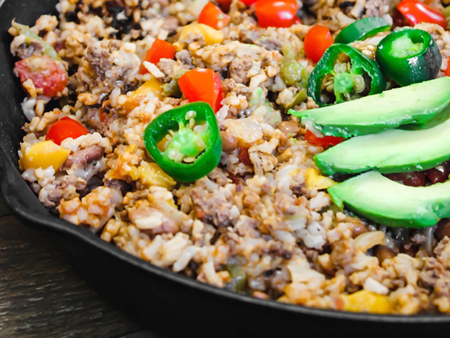 This tasty mixture of ground beef, rice, vegetables, and seasoning comes together in one skillet for a quick and easy cleanup. “It’s my favorite recipe on nights when I’m craving stuffed peppers but don’t want to deal with the extra step of actually stuffing them,” Ligos says. What to do: In a large skillet with a lid, heat oil uncovered over medium heat. When oil is hot, add onion and garlic, and cook for 3 minutes, or until onion starts to cook down and turns translucent. Add bell pepper, and sauté for another 2 to 3 minutes. Add beef, and sauté until brown, 4 to 5 minutes. Add rice and stir to combine, toasting rice for about 1 minute. Finally, add tomatoes, beans, broth, and spices, and stir to combine. Turn up the heat, and bring mixture to a boil. Cover, then reduce heat to low—making sure it’s still simmering—and cook for 30 minutes. Once done, stir to fluff rice. If you notice some rice still isn’t entirely cooked, cover and cook for an additional 5 minutes. Serve with any optional toppings you like. This meatless dish from Deborah Murphy, R.D.N., blogger at Dietitian Debbie Dishes, is packed with unique flavors from easy-to-use ingredients: sweet potatoes, spinach, chickpeas, and Greek yogurt. It’s perfect for colder months when you want something hearty and comforting, but you can make it anytime, Murphy says. 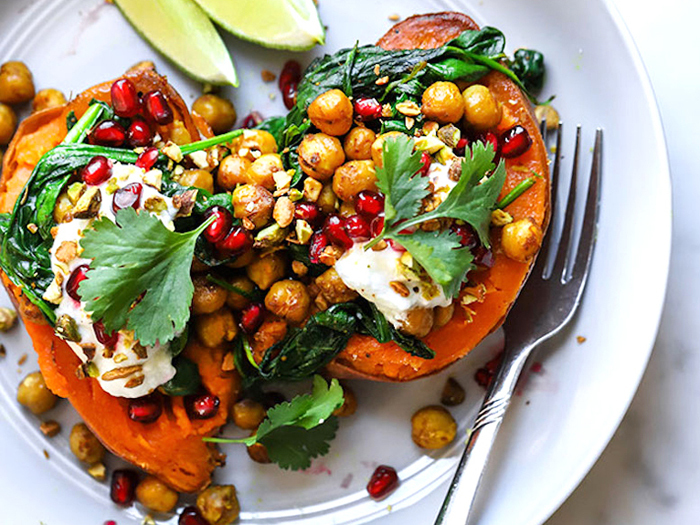 To get this meal on the table in less than 30 minutes, go with the microwave option for your sweet potatoes, or roast a batch in advance and reheat them for quick meals throughout the week. What to do: If roasting sweet potatoes, preheat oven to 375°F. Slice sweet potatoes in half lengthwise, rub with olive oil, and arrange cut side down on a baking sheet. Sprinkle with salt and pepper. 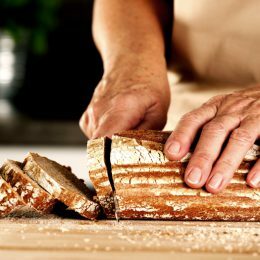 Bake for 35 to 40 minutes, or until tender when poked with a fork. If microwaving sweet potatoes for quicker meal prep, wrap whole sweet potatoes in a damp paper towel, and cook in the microwave for 6 minutes. Let cool slightly, slice in half lengthwise, and sprinkle with salt and pepper. Add olive oil and chickpeas to a skillet over medium heat. Stir in curry powder, smoked paprika, and garlic powder. Sauté for 5 to 7 minutes, or until chickpeas are starting to lightly brown. Stir in spinach, and cook until wilted. Add salt and pepper to taste. To assemble, add one potato and half of the chickpea-spinach mixture to a plate. Add any optional toppings you like, and serve with a lime wedge. You can enjoy this light meal on its own or bulk it up by serving over ½ cup of rice or quinoa. What to do: Preheat oven to 350°F. 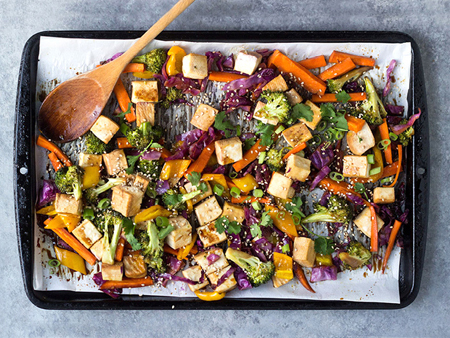 Meanwhile, line a baking sheet with parchment paper, and spread tofu pieces evenly on it. Add vegetables, spreading them in a single layer on the pan. Drizzle everything with olive oil. Bake for 20 minutes. Add teriyaki sauce, and bake for another 8 to 10 minutes. Sprinkle with your choice of optional toppings. Cooking fish en papillote is a French technique that calls for wrapping the fish in a DIY parchment packet with some vegetables and bit of cooking liquid. The fish picks up all the flavors of the veggies and liquid as it steams, and comes out perfectly tender. The version below comes from Michelle Dudash, R.D.N, author of Clean Eating for Busy Families, who loves the flavor pairing of capers and tomatoes. What to do: Preheat oven to 400°F. Meanwhile, season halibut with half of the salt and pepper to taste. In a medium bowl, mix tomatoes, basil, olive oil, garlic, lemon zest, capers, vinegar, pepper, and remaining half of the salt. Tear off two 15- by 12-inch sheets of parchment paper. Arrange sheets vertically, and place fish just below the center on each sheet. 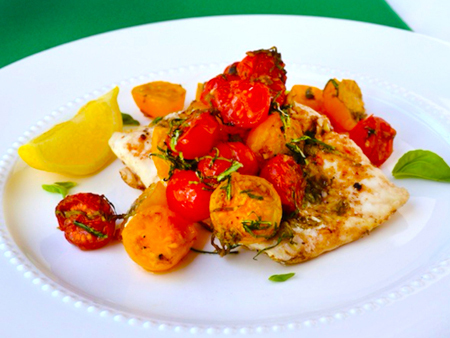 Arrange tomato mixture on top of each piece of halibut, dividing evenly. Fold parchment paper around edges tightly in ¼-inch folds to create a half-moon shape. Make sure you press as you crimp and fold to seal packets well, otherwise the steam will escape. Repeat with the other pouch, and place both on a large sheet pan. Bake for 13 minutes for 1-inch fillets, or until pouches make a strong sizzling sound. Adjust cooking time by a couple of minutes for thinner or thicker fillets. Remove from oven and serve immediately, placing pouches in shallow bowls or on plates. 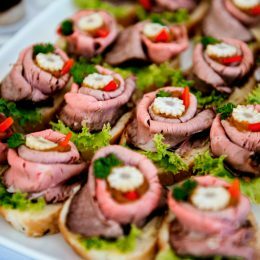 Allow diners to carefully unwrap or cut into their own portions, avoiding direct contact with hot steam. Garnish with additional fresh basil, and serve with lemon wedges. This cozy dinner comes together in well under 30 minutes on the stovetop, Dudash says. 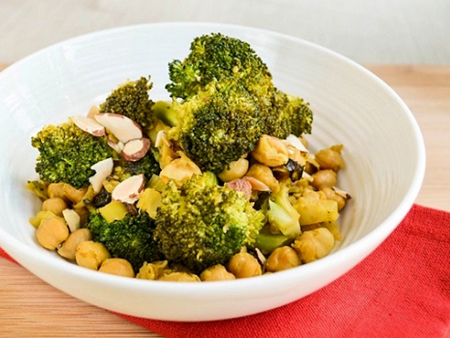 It’s meatless but packed with plant-based protein and fiber from the chickpeas and broccoli. What to do: Add oil to a large soup pot over medium heat. Brown broccoli and chickpeas in oil, about 9 minutes. Add onion, and cook until tender, about 5 minutes, reducing heat as needed. Stir in wine or broth, curry powder, liquid amino acids, and lemon zest. Cover loosely and simmer until broccoli is fork-tender, about 7 minutes. Serve with lemon wedges, and sprinkle with sliced almonds, if desired. Next PostI’ve Never Exercised. Is It Too Late to Start?